A British man has been killed and about 12 other people injured in a suspected suicide bomb attack in Qatar. 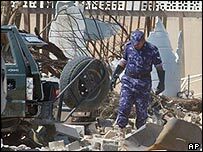 The car bomb blast occurred at the Doha Players theatre outside the capital, Doha, near a British school. The dead man has been named as Jonathan Adams. No group has said it carried out the attack but Qatar's interior ministry said the suspected bomber was Egyptian. Western embassies rank the threat from terrorism in Qatar as high. Al-Qaeda has threatened Westerners in the area. There have been a number of bombings in neighbouring Saudi Arabia. It was the first attack of its kind in the Gulf Arab state, which hosts the US military's Central Command. The UK Foreign Office confirmed the name of the dead Briton. His family has been informed but asked for no further details to be released. The Qatar interior ministry named the suspected bomber as an Egyptian, Omar Ahmed Abdullah. The blast occurred at a theatre opposite the Doha English Speaking school in the Khalifa district, a few kilometres from the city centre. The theatre was performing Shakespeare's Twelfth Night. One witness, Dima, told the BBC News website: "A huge blast ripped through the theatre. The audience ran out through the auditorium. There was dust everywhere and it stank of things burning." Another witness, Khaled Abdel Mohsen, said: "The sound was deafening. My windows blew out and my friend is in hospital. What evil person could do such a thing?" The chairman of the school's governors, Ivan Morgan, told Britain's Sunday Telegraph newspaper the school had just improved its security and bomb-proofed most of its windows. "That was the best £100,000 we have ever spent. There is a lot of damage but very little of it has happened to the school," he said. The attack comes on the second anniversary of the start of the US-led war in Iraq. The force of the blast shattered windows of houses and cars in the residential area. White plumes of smoke rose above the theatre, which was severely damaged. About 100 people are believed to have been in the venue at the time. The explosion has shocked the expatriate community in Qatar, where about 5,000 Britons live. There is also a large American contingent. The BBC's Gulf correspondent, Julia Wheeler, says many expatriates of all nationalities have been left feeling vulnerable and afraid. Some are considering leaving the country as thousands more have done before them after attacks blamed on terrorists in Saudi Arabia, our correspondent says. One expat, Iain Macdonald, told the BBC News website: "I have to seriously reconsider signing a new contract to work out here now that the arm of terror has gripped this small, friendly and generally benign country." However, a journalist for Qatar Radio, Gina Coleman, said she did not see the bombing as the start of a series of attacks: "I don't feel threatened and I certainly won't start walking around in fear."